as a remembrance of this special day and event. Just tell us the theme of your party and we will border the poems with appropriate colors and graphics. Each gift is wrapped to match your color scheme. All gifts are tagged with the recipients’ name and candle number. 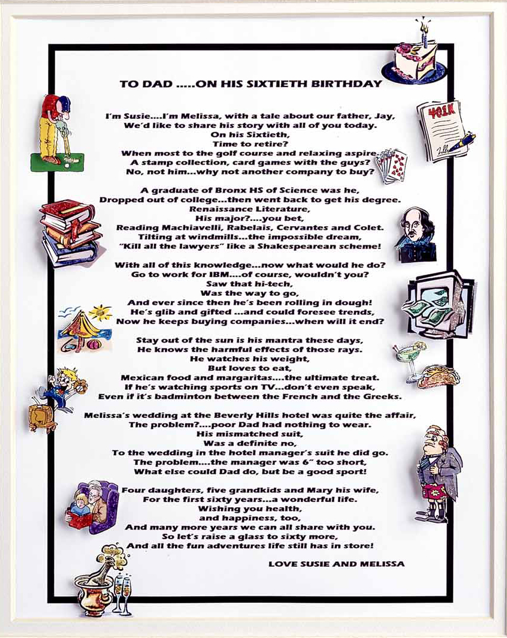 in large print … one poem per card and are ringed together for ease of handling. They also make a great memento! We mount the actual invitation and surround it with fun and whimsical 3-D graphics, depicting all of your child’s favorite things. It is then matted and framed. Print this order form, fill it in and send it along with your invitation… and we’ll take it from there. 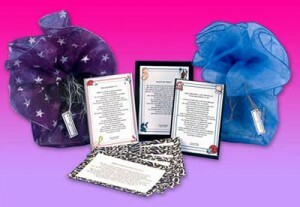 You will have a memorable, fun and one-of-a-kind gift or keepsake. The kids love to hang them in their rooms after the event. And don't forgot these make fun and special gifts for the Bat or Bar Mitzvah child when you're kid is on the circuit instead of another iTunes gift card or iPhone cover. 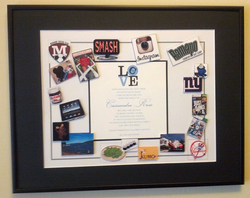 Celebrate someone’s special birthday/anniversary/ wedding with a personalized tribute. Why not make the event all the more entertaining and fun? 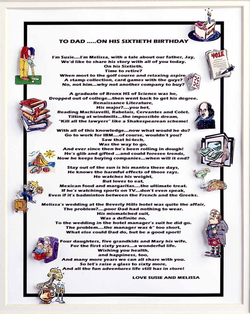 A poem can add to the enjoyment of any event…….from a Rehearsal Dinner to a Bridal or Baby Shower……invited to a 50th Anniversary? 40th Birthday? Retirement Dinner? Be the hit of the evening. 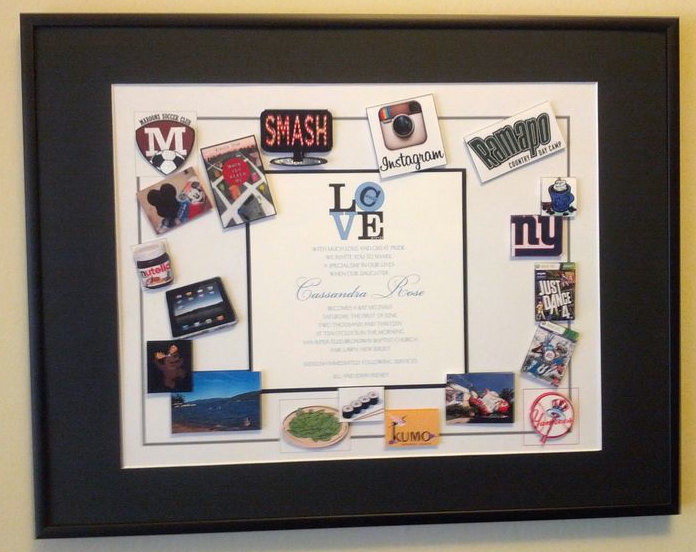 And the poem can be framed, matted and graphically enhanced as an unforgettable gift. The graphics are whimsical and created in 3-D to make a truly unusual piece of artwork. Or send us your photos sitting in a box collecting dust, and we’ll use them to enhance to poem. Does it get more personal than that? "Just a note to thank you for the spectacular gift you created for my father. The poem itself was wonderful: we read it in front of over 100 people amidst a roast, and it was a major hit. I couldn’t picture what you meant when you said 3-D graphics….the result is truly amazing. My dad had tears in his eyes (not an everyday occurrence).."